Ticks are part of the arachnid order Acarina. There are over 650 species of ticks. Ticks have four stages in their life cycle: egg, larva, nymph and adult. Ticks feed only on the blood of amphibians, reptiles, mammals, and birds. 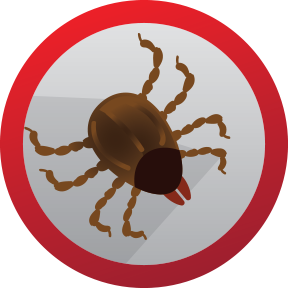 Ticks are large and have recurved teeth or ridges on the central mouthparts. They also have a sensory pit on each of the first pair of legs, which detects stimuli such as heat and carbon dioxide. Ticks also have the ability to detect light and dark as well as shapes, shadows and vibrations. There are two types of ticks: soft and hard. Soft ticks are those who feed on hosts that return periodically to a nest. While hard ticks are those that are found on pets, cattle, wildlife and even people.